Can I make a confession? We have a new Sunday tradition. It used to be pizza; now, it’s Pad Thai and papaya salad. OK, that’s not so bad. But the bad part is we get it delivered while sitting at home in our stretchy pants. And the worst part is it’s every Sunday. I have eaten papaya salad so many times at this point that I needed to know how to make it at home. In an ideal world, you would walk into a store that sells underripe green papaya. But that doesn’t always happen. And the good news is I tried it with a barely ripe papaya and it was still ridiculously delicious. I mean, ridiculously. See how everything works out in the end? I knew you’d come around. OK, on to the important stuff. This recipe comes together in just 30 minutes! And it’s easy! I was sure this recipe was going to fail because Thai dishes can sometimes be a little complicated and intimidating. But not this one! Trust me, you can do it. The sauce is where the magic happens. Honestly, even if you can’t find a papaya and just end up using carrots, cabbage, and tomato, it’s still insanely delicious, because the sauce is where it’s at. Peanuts, garlic, Thai chilies, coconut sugar, salt, lime juice, and vegan fish sauce (see the notes for a quick + easy recipe). Talk about a flavor bomb. This would make the perfect side dish to entrées like Spring Rolls, Creamy Thai Carrot Soup, Singapore Noodles, and Pad Thai (our go-to recipe is in 31 Meals!). Or, you could add my favorite crispy peanut tofu and call it a meal in itself! 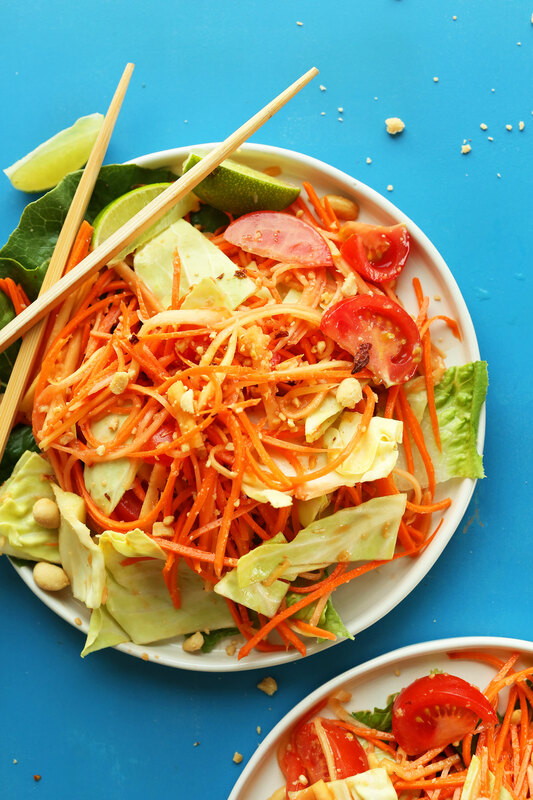 A 30-minute INSANELY flavorful Thai Papaya Salad with fresh vegetables and a zingy garlic-peanut sauce! Just as good as takeout and entirely plant-based. If you haven't already, prepare vegan fish sauce and set aside (find link above). 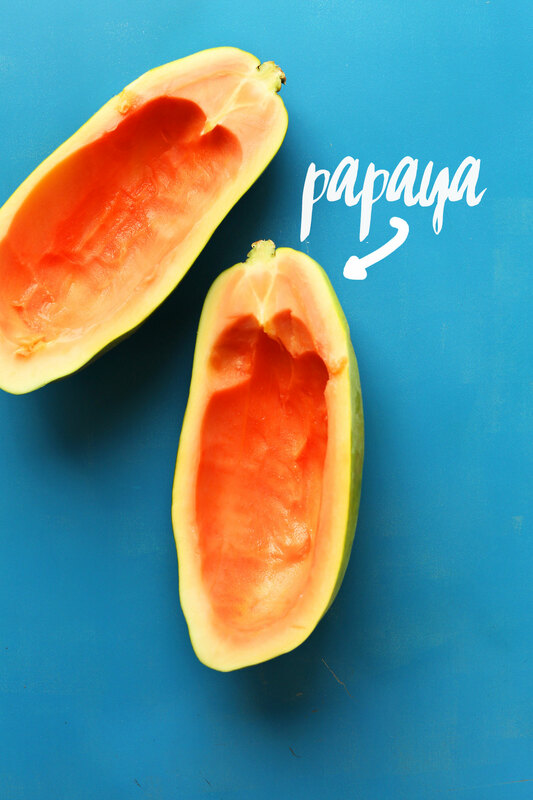 See notes for tips on finding a green papaya (mine wasn't quite green, but it still worked!). Then move onto prepping the vegetables. Once you've peeled your carrots, cut in half crosswise, and then cut those pieces in half lengthwise. Then use a mandolin* with a fine-tooth blade (or julienne peeler) to carefully shred the carrots into small strips (see photo). Continue until all carrots are shredded. Add to a mixing bowl. To prepare papaya, peel off the skin using a vegetable peeler, then halve lengthwise and scoop out seeds. Cut into small segments and shred into small strips using your mandoline or julienne peeler. Add to mixing bowl. Chop cabbage and tomatoes and add to mixing bowl as well. Set aside. To prepare sauce, add garlic, peanuts, chilies, coconut sugar, and salt to a mortar or small food processor and mash or pulse until it's a fine paste. Transfer to a small mixing bowl and add lime juice and vegan fish sauce. 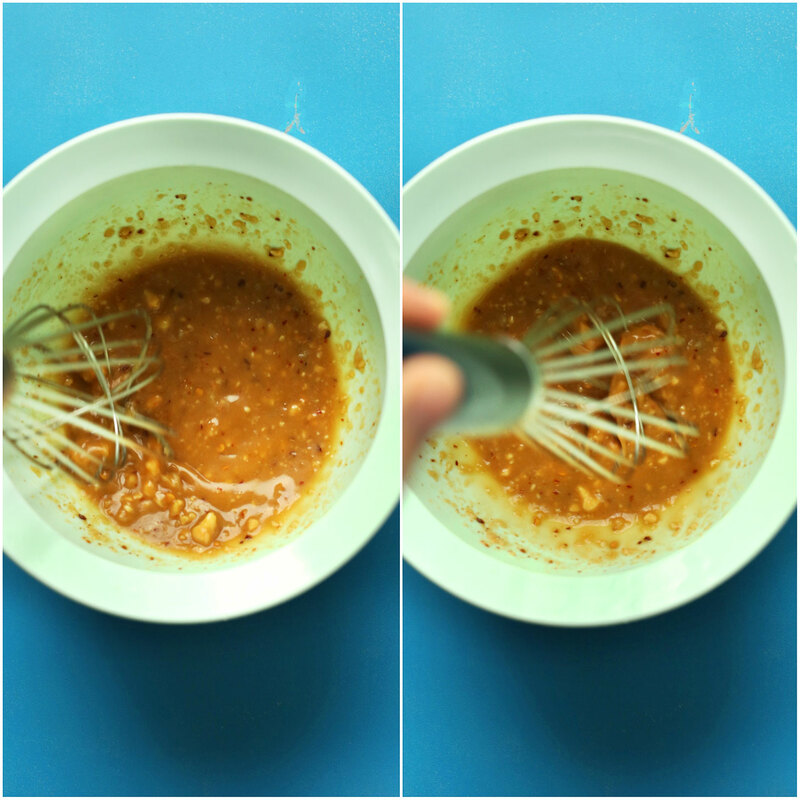 Whisk to combine, then sample and adjust seasonings as needed. Add sauce to vegetables and toss to combine. 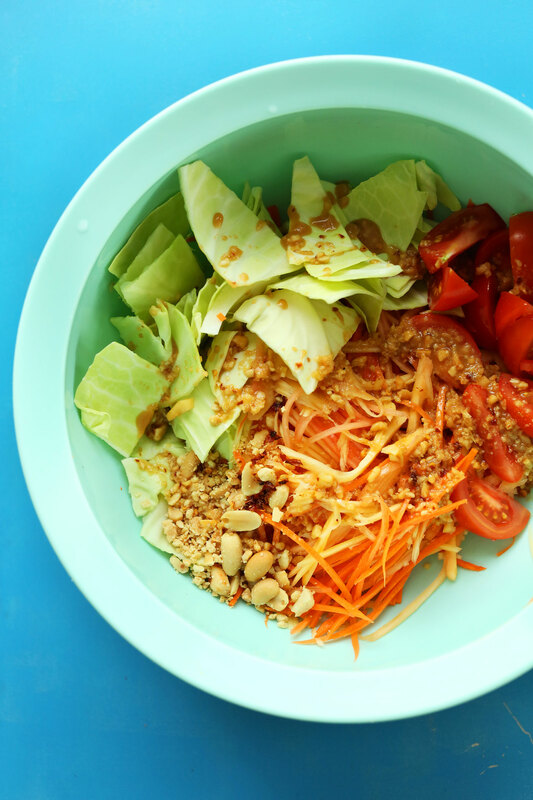 To serve, lay down romaine lettuce on serving dish(es) (optional), and top with papaya salad. Garnish with additional crushed peanuts and lime wedges. Best when fresh, though leftovers keep covered in the refrigerator for 2-3 days. 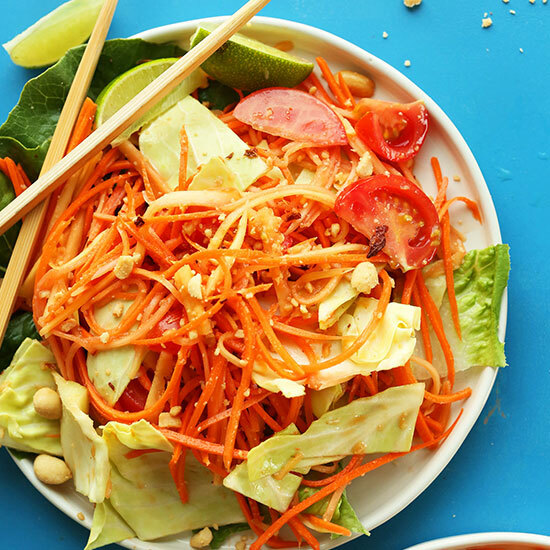 Papaya salad would make an excellent side dish to spring rolls and Pad Thai! *It can be challenging to find an underripe, green papaya unless you go to an Asian or specialty store. So, if you can't find one, simply buy the greenest papaya you can find, and use a vegetable peeler to remove the skin. Then halve it, and scoop out the seeds and most of the ripe flesh (save for other uses). Then chop into segments and finely shred with a mandoline or vegetable julienne peeler. *If you don't have a vegetable julienne peeler or mandoline, you can alternatively use a large sharp knife and chop the papaya and carrot very finely, though this takes quite a bit longer. *2 garlic cloves yield ~1 Tbsp minced garlic. *Recipe adapted from The New York Times. So from what I’m reading is that you don’t smash the papaya in a mortar and pestle which will help soften the unripe foods. From reading the comments and actually making thum hoong, the laotion way of saying papaya salad I have found out this is the most white washed recipe I have ever seen for a papaya salad. Is there any other option instead of vegan fish sauce? Not that we’ve tried, but if you experiment with other sauces, report back on how it goes! I just made this. I didn’t like the green papaya at all–too tough. and chili garlic sauce–2 teaspoons. The fish sauce recipe is brilliant!! sweet ripe papaya would be amazing in this. This tasted fantastic! I replaced all sugars with dates (1 per tablespoon sugar), to try to keep this as raw as possible. Did use coconut aminos instead of any soy sauce, and used a red papaya. Also used fresh PB instead of regular peanuts. The Thai peanut sauce is so delicious! I think I could survive on it. ? i am a volunteer for a non profit organization, making a cooking workshop flyer. i came across the papaya salad photograph. May i put your photograph onto the flyer? Hello, This looks amazing but the link is broken for the fish sauce. Would you mind posting the recipe for it? Im not sure if her site is closed or what. Thank you!!! I just tried it and the link worked for me! Perhaps you could go to Veganmiam and search for Vegan Fish Sauce? Oh my goodness Dana! This recipe was divine!! I loved the crunch of the peanuts, the spiciness of the chillies, and the freshness of the papaya and carrots! I didn’t have cabbage or romaine lettuce so I just used spinach and loved it! Thank you so much for sharing! Once again a recipe that doesn’t disappoint! 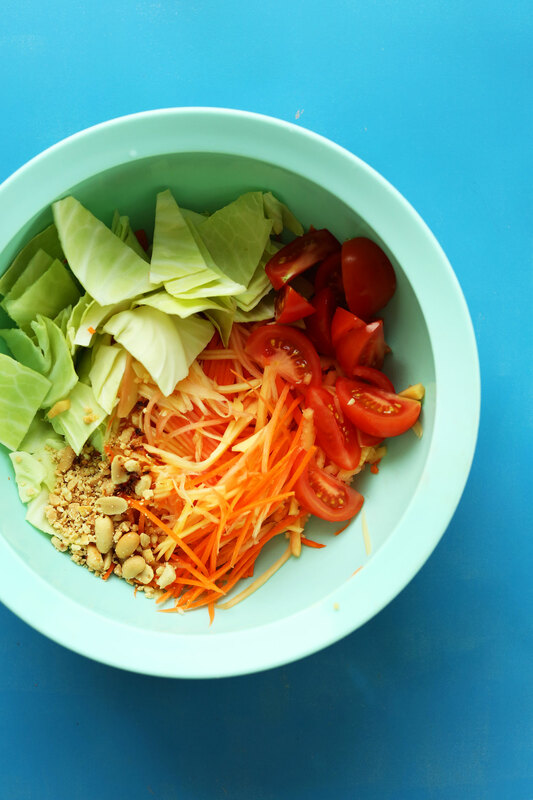 Papaya salad is very beneficial for our health and fitness. We should have to make use of papaya salad in our meal. It is the best to use papaya on face. It helps to increases face glow. I would love to share this nice post with everyone. Thanks to you for the nice post. Hey Dana! I’m in Portland, too! FuBonn has green papaya as of this past Saturday. Get it while the gettin’s good! The best fish sauce substitute is thin soy sauce (Thai), found at Asian markets. Hello Dana ! I am Big fan of your recipes. I have tried many of your recipes with your blogs help and all comes with better experience. Moat of your recipes were easy and small in ingredients but amazing in taste. Thanks for all ur efforts to make cooking so easy for us. Yum! I love Papaya, can’t wait to try this out! I took a cooking class in Thailand and they told us we could substitute the green papaya for carrot at home. I haven’t tried it myself since it’s basically the recipe without the papayas, but it might still taste good! Love the photos. Gorgeous. Tip: often when I order papaya salad in a restaurant, I’m informed that they didn’t have papaya and made it with green mango instead. So there’s another alternative out there! Ooh, great tip! Thanks for sharing! Can’t wait to try out this sauce, looks so delicious! Love that you used papaya, always looking for ways to use it! This looks awesome. Super simple and totally delish! Love it! Oh my gosh, yum!! I’m usually not a fan of papaya (or as we call it here in Australia, pawpaw! ), but you have totally convinced me to change my ways, Dana! And that dressing…I think I could just eat it with a spoon, sans salad! aha! Now I know where my sister’s “paw paw lamb curry” got it’s name! Yum! 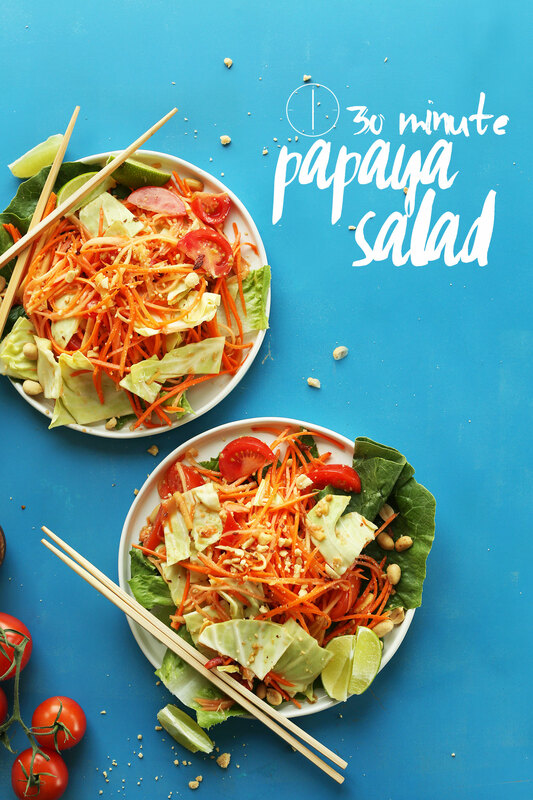 I LOVE papaya salad and have been curious about how to make it on my own! This recipe will be perfect. Can’t wait to try it! Green mango works wonderfully too and is easier to find! Just the smell of it makes me feel queasy. Maybe the trick is to only eat under-ripe papaya?! I’ll have to give it a shot haha. This is traditionally made with green papaya (not underripe-completely different type), and tastes different from it’s orange and pink fleshes cousins. It might be worth a try if you are feeling adventurous at a Thai restaurant. Yum! Sounds wonderful. I like anything peanutty! Can’t wait to try this! One note for vegans — “regular” dry roasted peanuts are usually made with gelatin. Look for the “lightly salted” to avoid. Living in Kansas, I’m going to go ahead and skip the papaya because I’m not sure I’ve ever even seen one in our small-town grocer. :P But it sounds so delicious! That sauce sounds like something that I want to pour all over my everything. Yum! Anything that tastes like the tropics is a hit around here! I’d love to make this with your Pad Thai recipe…..is it available on this site? Thanks! Yeah, Sundays are a big nap day after church, but seriously, this sounds like a great tradition. I guess though I’m on mandolin duty for slicing, my wife cut the end of her finger off last time she used a mandolin!!! You should have seen the blood. Unreal. They sewed her finger back on but it’s still not quite right. Anyhow, papaya’s are something I always see in the grocery store but never buy. Time to try it!!! I adore papaya salad. When I travelled through Thailand I would eat it everyday, extra spicy!